The Bunga Finger & Toe Caps will protect the entire finger or toe/toe nail with a comfortable gel line elastic cap. 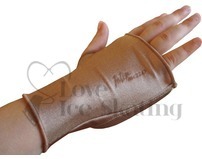 Protects all sides of the finger or toe, as well as the toe or finger nail against injury and bruising. Generally, small is for the smallest toe, large is for the big toe and medium is used for the toes in between.